This traditional Hanukkah gift basket is all decked out in traditional colors and filled with mouthwatering snacks. There are eight days of Hanukkah and this gift basket would be a great gift to any family who celebrates the Festival of Lights. This traditional Hanukkah gift basket is all decked out in traditional colors and filled with mouthwatering snacks. There are eight days of Hanukkah and this gift basket would be a great gift to any family who celebrates the Festival of Lights. 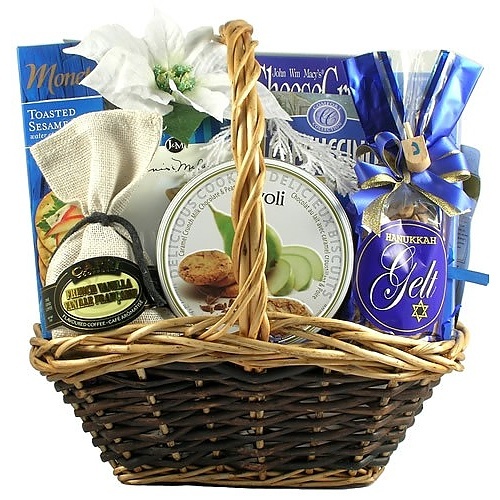 Celebrate Hanukkah with them by sending this beautiful gift basket filled with an abundance of delicious treats! This Hanukkah gift basket is truly worth celebrating!